Is it hard to zero-in a scope? If you don't know how then obviously, the answer is yes. Thankfully, this article will show you exactly how you can zero-in a scope with ease before putting it to good use, either on the range or out in the field. There will be easy to understand steps to follow, so read them carefully as you go. Once you know the instructions, you'll be able to zero-in your scope with ease. Also, keep this handy in case you forget a step or two. This should serve as a kind of referral guide in case you get stuck. What Does It Mean To “Zero” A Scope? Zeroing-in is basically aligning the sight on your scope so the bullet can hit where you aim it at. A rifle will not be manipulated to a point where the bullet’s path is changed. The sight alone has to be adjusted. Windage and elevation are adjusted in order to move the rear sight, also known as the reticle, to focus your eye on the location the bullet will hit, without regard to your distance from the target. The range is completely up to you. The bullet will follow the bore axis out of the muzzle and flies almost parallel to your line of sight until the natural force of gravity changes its trajectory. The following are three simple steps on how you can zero-in your scope. Keep in mind this also includes installing the scope itself before you go through with the process. Follow each step along carefully. For future reference, go back to these steps in case you forget how to zero-in. To begin, you need to mount the rings and the base onto the scope. This starts with a good quality base and mounting rings that should hold strong for years to come. Keep in mind that while you’ll probably spend a little extra on a mounting kit that is strong and durable, it’s a lot better than having to waste more money over something that will fall apart easily. In order to install the mount, use the screws to tighten onto the mount. This depends on the instructions based on the manufacturer. The best way to install it is by using the “X” pattern. This way, you’re not pulling the scope one way or the other. Screw the screws in loosely and make adjustments if needed. Next, mount the scope on the rifle. Lay the scope onto the bracket. The manufacturer should have instructions that show you how to do this. Make sure that the eyepiece is oriented in the correct direction. Use a torpedo level by laying it on top of the scope to check to make sure it is level and tighten the rings firmly. Third, you should position the eyepiece correctly. Set the distance to your shooting eye so when you’re in the shooting position, the position of the eyepiece is correct as well. After that, level your crosshair. Your rifle should be held in a steady position while you’re doing this. For best results, mount your rifle on a stand so that the gun’s stock is leveled and squared to the ground. Then, rotate the crosshair so that the vertical crosshair is positioned at the 12 o’clock spot or top dead center. Finally, tighten the base securely. Before you do this, check one last time that your vertical crosshair is positioned at the top dead center. Then gradually tighten your rings. Be sure that you tighten them half a thread at a time. Always check the crosshair before proceeding. The first thing to do when setting your zero is simple: you go to the range. For best accuracy, you will need to shoot from a variety of positions with your new sight. You should do this at a gun range where you know the distances and your backstops. Of course, it goes without saying that you should practice proper gun safety and bring necessary protection for your eyes and ears. Depending on how long you plan on being at the range, be sure to bring enough ammunition to last you the entire session. 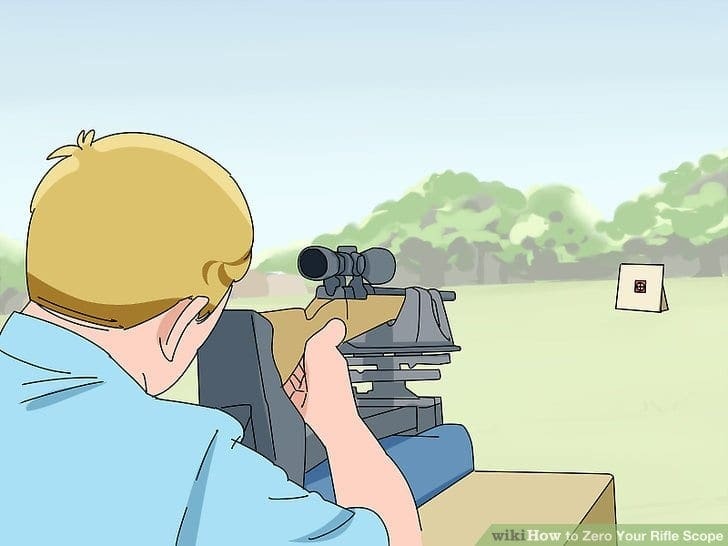 You should use the bullseye of the target for zeroing. You will have a lot of measurements to work with so you can make any necessary adjustments. The more “off” each hit is, the more accurate that you can be able to sight-in. As always, you should adhere to the rules and regulations that your range has set up. At the range, you should mount your gun in a rest. While you're zeroing a rifle in, you need to eliminate user-error as much as possible. Strictly speaking, you can't miss a shot. In order to achieve the most accurate zero, you need to mount your gun on a rest specifically for this purpose. You can find a mount like this at a sporting goods store or at the range (if available). In case you don't have a solid gun rest, get in the most solid shooting position as possible. You can also use a couple of books or your boots as something that will help you rest the gun more steadily. Finally, load the gun and take three to five practice shots. Once you’re finished, examine your shot grouping. If necessary, make any adjustments that you see as fit. You should also set zero at other distances. So, you can do this from 20 yards at first. Then you can move up to a longer range like 50 yards, 100 yards, etc. Now, it’s time to make adjustments. Most scopes should have two knobs. One will be on the top and the other should be on the side. The top knob is used to adjust the up and down of the crosshairs. The side will adjust the scope from left to right. You should move the sight towards misses. If you missed high, move the scope higher. Miss it to the left, move it to the left. You get the idea. Make sure you continue to make necessary adjustments until you are consistently hitting your bullseye. Be sure to make small adjustments if and when necessary. This video that runs close to two minutes will show you how to zero-in your scope. Pay close attention to each instruction. Like this guide, you should refer back to this video often in case you tend to forget how to zero your scope. Zeroing-in a scope can be a challenge and cost you money. But doing it yourself will save you more pennies in your pocket. So, follow this guide and be sure to refer back to it each time you have a scope that needs to be zeroed in.